Welcome to my website! I am Assistant Professor at IESEG School of Management in Paris, France. You will find more information about my teaching and research activities in behavioral sciences. 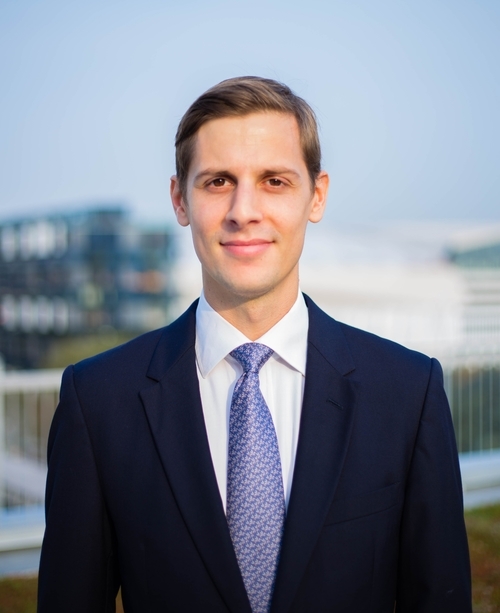 I am currently Assistant Professor at IESEG School of Management in Paris, France & Visiting Assistant Professor at Boston University, Questrom School of Business. I hold a Ph.D. in Management Sciences from Paris-Dauphine University. Before joining IESEG, I visited Smeal College of Business at Penn State, and was post-doctoral fellow at ESSEC Business School. My research in behavioral sciences has been featured in Marketing Science, International Journal of Research in Marketing, Journal of Business Ethics, Social Science & Medicine and Marketing Letters. I particularly enjoy teaching doctoral seminars on moderation and mediation analyses. My research aims at generating new insights in human behavior applied to health and well-being, with a special focus on eating behaviors. In turn, I wish to better understand how to harness the behavioral science insights through innovative interventions in marketing and public policy. I am using a combination of data sources and methods, including primary data with experimental designs as well as secondary data with econometric and meta-analytical techniques. Cadario, Romain & Pierre Chandon (2019). Which Healthy Eating Nudges Work Best? A Meta-Analysis of Field Experiments, Marketing Science, forthcoming, (Link). An abtract of this article presented at the BFDG Conference 2018 was published in Appetite, 130(1), 300. Cadario, Romain & Pierre Chandon (2019). Effectiveness or Consumer Acceptance? Tradeoffs in Selecting Healthy Eating Nudges, Food Policy, forthcoming, (Link). Rousselet, Evelyne, Bérangère Brial, Romain Cadario & Amina Béji-Bécheur (2018). Moral intensity, issue characteristics and ethical issue recognition in sales situations, Journal of Business Ethics, forthcoming, (Link). Cadario, Romain, Béatrice Parguel & Florence Benoit-Moreau (2016). Is bigger always better? The unit effect in carbon emissions information, International Journal of Research in Marketing, 33(1), 204-207 (Link). Cadario, Romain (2016). The impact of health claims and food deprivation levels on health risk perceptions of fast-food restaurants, Social Science & Medicine, 149, 130-134 (Link). Cadario, Romain (2015). The impact of online word-of-mouth on television show viewership : An inverted U-shaped temporal dynamic, Marketing Letters, 26(4), 411-422 (Link). Cadario, Romain & Béatrice Parguel (2014). Reconsidérer la discrétisation des variables quantitatives : vers une nouvelle analyse de modération dans la recherche expérimentale, Recherche et Applications en Marketing, 29(4), 120-140 (Link, Supplementary materials). I teach a variety of classes in marketing, behavioral economics and applied statistics, at both undergraduate and graduate level. I conducted doctoral workshops on moderation & mediation analysis at various institutions such as Paris-Dauphine University, UCL Mons, Paris-Est University and FNEGE. Cet ouvrage propose un guide pratique de la méthode expérimentale en sciences humaines et sociales, au sein de disciplines variées telles que la psychologie, le marketing, le management, la santé publique, l’économie ou encore la sociologie. Il rappelle les grands principes de la méthode expérimentale et offre un soutien à chacune des étapes de sa mise en oeuvre : (1) phase de conception de l’expérimentation en amont, (2) analyses statistiques et interprétation des effets principaux, modérateurs et médiateurs avec le logiciel SPSS®, (3) rédaction et représentation graphique des résultats de l’analyse. You will find below a selection of various media exposure, blog posts, news and other information. An interview about my meta-analysis of healthy eating nudges in field experiments, from Michelle Zong and Rachel Kahn – Center for Advanced Hindsight, Duke University. 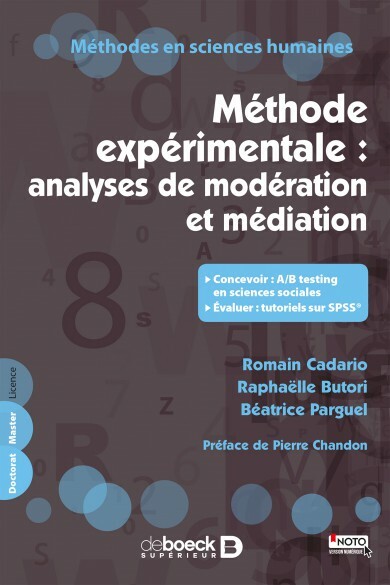 Guide pratique pour concevoir, analyser, interpréter et représenter les effets modérateurs et médiateurs dans une expérimentation en sciences sociales avec le logiciel SPSS. Based on an interview with Romain Cadario on his paper “The impact of health claims and food deprivation levels on health risk perceptions of fast-food restaurants” (Social Science and Medicine 2016). Check out our research about the unit effect in CO2 emissions information, published as a replication paper in International Journal of Research in Marketing.